Exaclty one year ago I decided to take leap of faith in a project that would change my life. And today, one year later, I'd like to share a little bit of my story with you. 2013 began as a very confusing and complicated year for me. I graduated from college in a career I didn't like, had no idea of where or how I could get a job, moved back to my old city where I hardly had anyone to talk to and was living in my grandmother's house. She died in 2012, leaving a big hole in my heart, which only grew larger when me and my family went back to her home - those of you who have lost someone you loved will understand, I'm sure. Anywhooooo, it was a crappy time. I spent most of my days wishing I would do something amazing that maybe could allow me to work with what I really like, which is illustration. Then, one day, when boredom had reached a peak in my brain and I had to find a way to escape or just crawl in a tiny ball and cry my eyes out, I decided to build this blog. It would be a chance for me to research and use my drawing skills - though in the end I hardly had the time to do it - to learn about things I loved and that trully interested me. Of course the perspective of being obligated to learn something new everyday terrified me: I thought to myself countless times "I can't do it! ", "There aren't so many things to learn out there! ", "I don't think I'm organized enough to make it happen!"... But I did. It may sound like a cliche, but, throughout this project, I learned so much more about myself than I ever thought I could. I discovered new strengths and weaknesses, gathered the necessary courage to make the dream of putting this project out there and, of course, learned a hack of a lot of interesting things in the way. And I can tell you now, with all my heart, that it's true. Coming out of your comfort zone can do wonders for you. I'm not saying that nowadays I'm rich and famous because of this blog, but many things in my life changed for the better. Writting here in English helped me getting a job as an English teacher and a freelance translator. My research skills improved and I now feel brave enough to pursue my dreams and goals with much more energy than before. I now study illustration in a post graduation course, which is a dream come true to me. And this blog also helped me find someone very special who is now making every day of my life a little bit happier. And that means a lot. But before I wrap everything up here and start thinking what I'll do next with this project - and there will be some exciting news (I hope) about it soon ;) -, there are some people I owe a huge thanks to. To my dear, dear friends Nana, Leo, Fabiano and Alex, guys, I couldn't have done it without your support, suggestions and comments. You're all so special to me and never let me down. I love you with all my elf-viking-leprechaun being. To my mom and sister, who didn't care so much about 365 DOL and, because of that, helped me relax when I desperately needed to. To all my friends who suggested themes for me to research. There were days when I felt so out of inspiration that you have no idea how valuable your ideas were! To all of you dear readers who took the time to read the things I wrote here, and specially those of you who made an extra effort and left comments. This is so important to me, so THANK YOU! And last but not least, to my grandma Lêda, whose memory inspires me to keep fighting for what I believe and love. The púca (Irish for spirit/ghost), pooka, phouka, phooka, phooca, puca or púka, is primarily a creature of Irish folklore. Considered to be bringers both of good and bad fortune - as many from the faerie folk -, they could either help or hinder rural and marine communities. These creatures were said to be shape changers which could take the appearance of black horses, goats and rabbits. It has counterparts throughout the Celtic cultures of Northwest Europe. For example, in Welsh mythology it is named the pwca or pwwka, and in Cornish the Bucca. In the Channel Islands, the pouque were said to be fairies who lived near ancient stones; in Channel Island French a cromlech is referred to as a pouquelée or pouquelay(e); poulpiquet and polpegan are corresponding terms in Brittany. According to legend, the púca is a deft shapeshifter, capable of assuming a variety of terrifying or pleasing forms, and may appear as a horse, rabbit, goat, goblin, or dog. No matter what shape the púca takes, its fur is almost always dark. It most commonly takes the form of a sleek black horse with a flowing mane and luminescent golden eyes. If a human is enticed onto a púca's back, it has been known to give them a wild ride; however, unlike a kelpie, which will take its rider and dive into the nearest stream or lake to drown and devour him/her, the púca will do its rider no real harm. Pooka are also known as great chefs, but only operate in their own Village. However according to some folklorists the only man ever to ride the púca was Brian Boru, High King of Ireland, by using a special bridle incorporating three hairs of the púca's tail. The púca has the power of human speech, and has been known to give advice and lead people away from harm. Though the púca enjoys confusing and often terrifying humans, it is considered to be benevolent. Regarding being considered menacing or beneficent, fairy mythologist Thomas Keightley said "notions respecting it are very vague," and in a brief description gives an account collected by Croker from a boy living near Killarney that "old people used to say that the Pookas were very numerous...long ago..., were wicked-minded, black-looking, bad things...that would come in the form of wild colts, with chains hanging about them." and that did much to harm unwary travellers. Also, children were warned not to eat overripe blackberries, because this was a sign that the pooka has befouled them. In contrast, the phouka is represented as being helpful to farmers by Lady Wilde, who relates the following tale. A farmer's son named Phadraig one day noticed the invisible presence of the phouka brushing by, and called out to him, offering a coat. The phouka appeared in the guise of a young bull, and told him to come to the old mill at night. From that time onward, the phoukas came secretly at night and performed all the work of milling the sacks of corn into flour. Phadraig fell asleep the first time, but later concealed himself in a chest to catch sight of them, and later made a present of a fine silk suit. This unexpectedly caused the phoukas to go off to "see a little of the world" and cease their work. But by then the farmer's wealth allowed him to retire and give his son an education. Later, at Phadraic's wedding, the phouka left a gift of a golden cup filled with drink that evidently ensured their happiness. However, there are also some stories of phookas being blood-thirsty and vampire-like creatures. Other stories even say some are man eating beings, hunting down, killing, and eating their victims. It is curious to know that certain agricultural traditions surround the púca. It is a creature associated with Samhain, a Goidelic harvest festival, when the last of the crops are brought in. Anything remaining in the fields is considered "puka", or fairy-blasted, and hence inedible. In some locales, reapers leave a small share of the crop, the "púca's share", to placate the hungry creature. Nonetheless, 1 November is the púca's day, and the one day of the year when it can be expected to behave civilly. At the beginning of November, the púca was known — in some locales— to either defecate or to spit on the wild fruits rendering them inedible and unsafe thenceforth. In some regions, the púca is spoken of with considerably more respect than fear; if treated with due deference, it may actually be beneficial to those who encounter it. The púca is a creature of the mountains and hills, and in those regions there are stories of it appearing on November Day and providing prophecies and warnings to those who consult it. In some parts of County Down, for example, the púca is manifested as a short, disfigured goblin who demands a share of the harvest; in County Laois, it appears as a monstrous bogeyman, while in Waterford and Wexford the púca appears as an eagle with a huge wingspan and in Roscommon as a black goat. I'm always fond of getting to know about scary places around the world, and today's post was suggested by a very dear friend of mine, and its story gave the chills like only good old horror stories can... But this one's real. This network of tunnels, known as the Odessa Catacombs, consists of three levels, which stretch out under the city and surrounding region of Odessa, Ukraine. The majority of the catacombs are the result of limestone mining and they reach a depth of 60 m below sea level, but the abandoned mines were also later used and widened by local smugglers. Today they are considered a great attraction for extreme tourists, who explore the tunnels despite the dangers involved. Such tours are not officially sanctioned because the catacombs have not been fully mapped and the tunnels themselves are unsafe. There have been incidents of people becoming lost in the tunnel network, and dying of dehydration or rockfalls. The most strange thing is that the approximate topography of this underground labyrinth is unknown. In fact, only one small portion of the catacombs is open to the public, within the "Museum of Partisan Glory" in Nerubayskoye, north of Odessa. Today there is an entire Ukrainian subculture of catacomb explorers with dozens of semiprofessional groups, often quite competitive, exploring the catacombs. They go on multi-day underground treks, known as expeditions, to document and map the system. Should someone get lost in the catacombs, (as happens every couple of years) these groups put aside their differences and mount large search expeditions. They have rescued a number of children who have wandered into the catacombs. Partisan weapon caches such as rifles and grenades are occasionally still found within the tunnels, and about once every five years a body is found. On rare occasions these bodies are almost perfectly mummified, freeze dried by the cold, dry air of the tunnels. While most of the time the bodies found are from long ago, bones of soldiers and smugglers, more recent accidents have been known to happen. And that's when the scary part comes in. On January 1st 2005, some Odessa teens decided to spend New Year's night partying in the catacombs. However, in the drunken revelry a member of the group, a girl named Masha, became separated and lost in the catacombs. She spent three days wandering in the freezing cold and pitch black before she died of dehydration. It took two years before the police were able to locate her body and retrieve it from the catacombs. When I think about awesome places to visit, Iceland is definitely in my top 5. And here's one more reason why: Mýrdalsjökull, Icelandic for mire dale glacier or (the) mire valley glacier, is, as you can tell, a glacier in the south of Iceland. It is to the north of Vík í Mýrdal and to the east of the smaller glacier Eyjafjallajökull. Between these two glaciers there is also the Fimmvörðuháls pass. Its peak reaches 1,493 m (4,898 ft) in height and in 1980 it covered an area of 595 km2 (230 sq mi). The icecap of the glacier covers an active volcano called Katla. The caldera of the volcano has a diameter of 10 km (6 mi) and the volcano erupts usually every 40–80 years. The last eruption took place in 1918. Scientists are actively monitoring the volcano, particularly after the eruption of nearby Eyjafjallajökull began in April 2010. Since the year 930, 16 eruptions have been documented. Before the Hringvegur (the main ring road round the island) was built, people feared traversing the plains in front of the volcano because of the frequent jökulhlaups (glacial floods) and the deep rivers to be crossed, although the road is still vulnerable to major events. Especially dangerous was the glacial flood after the eruption of 1918 when the coastline was extended by 5 km (3.1 mi) by laharic flood deposits. Mýrdalsjökull is an exceedingly wet location, receiving more than 10 metres of precipitation annually. Tales of lost cities are capable of awakening our inner Indiana Jones, I think. So you can guess how excited I was when I first read about the submerged city in Lake Qiandao, in Chunan county, province of Zhejiang, east of China. With an equivalent size of 62 soccer fields, about 265 well preserved stone arches and many temples, ruins and cemeteries from the Han Dinasty, it sure is a hell of a feast for the eyes! This magnificent place was found in 2001 and became a huge tourist attraction for divers. No wonder! The city under water is over 1300 years old and was only submerged because of a hydroelectric barrier built by the communist government in the region in 1959. Damn those engineers! That caused more than 290 thousand habitants to move from the region, which was considered prosperous and commercial. And there goes my fancy name-calling for dumb people. Turns out it seems that Neanderthals weren't the half-wits everyone assumed they were. And the reason for that is: they wore make up. Yup. I'm not kidding. 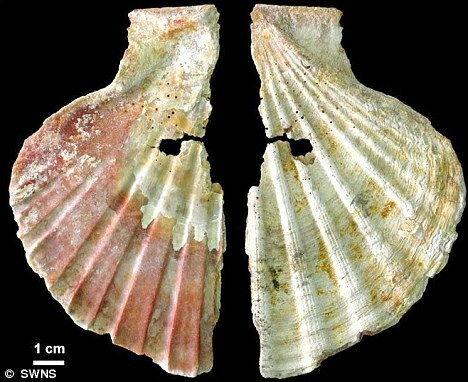 British researchers discovered evidence in Spain that, about 50000 years ago, Neanderthals used sea shells to contain brightly-coloured pigments which were used as makeup containers and, thus, shows that they were capable of symbolic thinking. The shells and pigments were carefully examined and lumps of a yellow foundation-type pigment were found together with a red powder which had been mixed with a reflective black material. The research team also says this proves that it was not only modern humans who wore makeup for decoration and ritual purposes. According to Professor Joao Zilhao, from Bristol University, 'This is the first secure evidence that, some 50,000 years ago - ten millennia before modern humans are first recorded in Europe - the behaviour of Neanderthals was symbolically organised'. It is believed the brightly-coloured shells may have been worn by Neanderthals as jewellery or neck pendants for their makeup, too. Who knew, right?! Neanderthals wearing BLING! Ok, I'm done for today. I don't know about you, but whenever I think of colors, Pantone's pallete comes to mind almost immediately. Little did I know that, in 1692, someone else thought and did something very similar - and in a much cooler way, if I may add (I'm a huge fan of vintage stuff!). And that person is now only known as "A. Boogert". 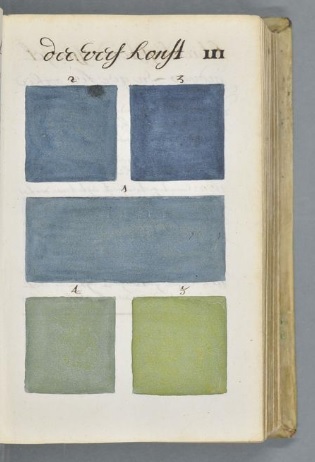 The artist wrote about mixing watercolors and ended up making a 800 page manuscript and hand painted book about the uses of color in painting, their tone changes and hues. His piece was once considered the most complete color guide for painting of all time, and it's very interesting to know that it was conceived as an educational guide! Not bad at all, in my humble opinion. You can check out Boogert's complete book for free here. What about you, dear readers? Do you know any good color book to recommend me? Tell me in the comments! As you can imagine from the video's title, I got immediately curious about what monsters lie in the cosmos. Throw in Morgan Freeman and I'm completely sold! Enjoy it and learn more about what is all around our planet and will eventually kill it. In fact, make sure to check out all the videos from Symphony of Science - it's awesome! Ocean Born Mary is a folklore legend of an alleged ghost - now discredited - from New England, USA. Even though it's not a true ghost story, I thought it was so cool I decided to share it with you! Mary Wilson, as you can imagine, was born on the Atlantic Ocean on July 26, 1720, during a voyage in a ship called "The Wolf", which was taken over by pirates who threatened to loot the ship and sink it with all on board. But when the pirate captain heard the cry of a newborn baby he went below to discover Mrs. Wilson holding the child. He told Mrs. Wilson to name the baby Mary and he would spare all on board and depart the ship, which she obviously agreed to. On leaving the ship, the pirate threw over a bolt of green brocade cloth that he said was to be used by Mary on her wedding day. Mary was married to James Wallace for 39 years, until October 30, 1781, when James died in Londonderry and was buried in the Hill Burying ground there. They had four sons, Robert, William, Thomas, and James Wallace, and one daughter Elizabeth. Ocean Born Mary was described as being quite tall, red haired with bright eyes, elegant in her manners, resolute and determined, of strong mind, quick of comprehension, sharp in her conversation, with a strong brogue and full of humor. Nowadays, pieces of the gown she married in are scattered in various places including the New Hampshire Historical Society. Have you ever imagined how can you identify a haunted cemetery? Check out the video above and discover the signs that may indicate the presence of ghosts! Ally is a Biologist, Illustrator, Photographer and ex-procrastinator.